Congratulations, just by the fact that you're reading this it means that you're researching scuba diving on St. Croix that ISN'T arranged by the ship. You'll probably save a few dollars and you won't be herded around with the crowd. 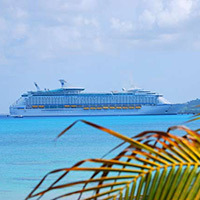 We have two choices for guests visiting St. Croix from a cruise ship. Our west shore dive boat Scuba Dos departs from directly off of the cruise ship pier at 10:00am for a two-tank dive along a gorgeous reef and maybe a wreck. It's back on the pier around 1:30pm. It also goes back out at 2:00pm and does a one-tank reef dive returning around 4pm, in plenty of time for most ships as you'll be right on the cruise ship pier. Just look at how close we are to the ship in the photo above. Travel times to the dive sites are normally less than 15 minutes and you'll be in sight of the ship at all times (other than when you're underwater). Even though this is a pretty large (31') boat we limit it to 10 divers to ensure that everyone gets the personalized service for which we're known. You won't be crammed onto a crowded boat. The picture to the right is our boat as you would see it walking along the pier from your cruise ship. 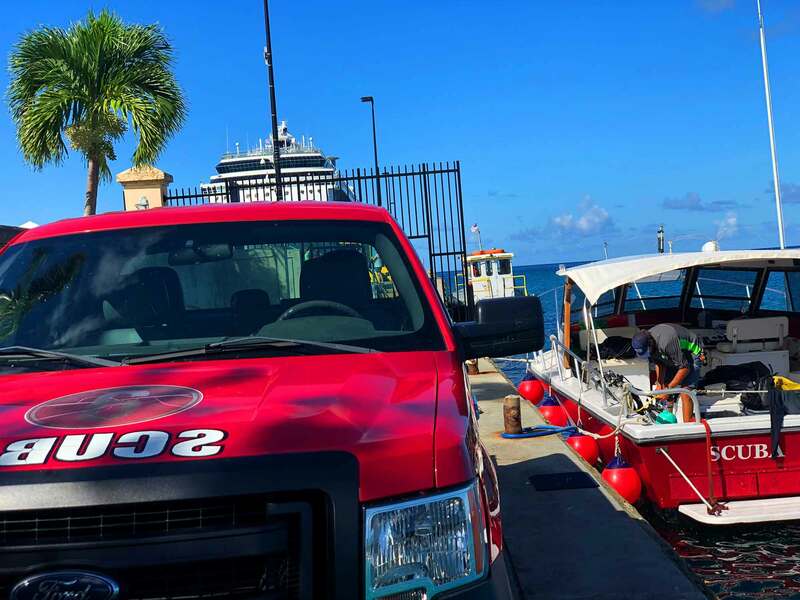 Our north shore dive boat Reliance departs from the Christiansted Boardwalk at 930am (on cruise ship days--normally it's 8:30am) and does a wall dive followed by a reef dive. It returns to Christiansted around 1pm. It's about 35-40 minutes from the cruise ship pier to Christiansted. There's a shopping Christiansted shuttle that does the trip for $16 roundtrip. Taxi vans are also available at the Pier. The picture to the left is the Christiansted Shuttle booth on the cruise ship pier. If you're NOT a certified diver you can still experience the wonderful underworld that surrounds St. Croix during your cruiseship stopover. 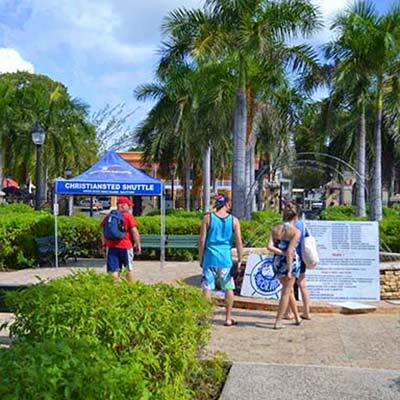 With our Discover Scuba Diving program, we'll take you right across the street from the dive shop to the shallow waters adjacent to the cruise ship pier. We'll use that shallow water to get you used to breathing underwater and show you a few tricks of scuba diving like getting water out of your mask. We do the training at 10:00a, and it generally takes less than 2 hours. You'll have plenty of time for lunch and there's several great lunch places nearby. Then you'll be ready to board our custom dive boat at 2:00pm and go out and do a dive along a gorgeous Caribbean reef before returning back to the cruise ship pier around 4pm. You'll be in sight of the ship at all times other than when you're underwater of course.